IDP will provide free counseling and seminar to students who are interested. To register, go to www.idp.com/philipines/flightidp or contact the IDP offices at (02) 8160755 loc 116 (Manila) and (032) 2362758 (Cebu). 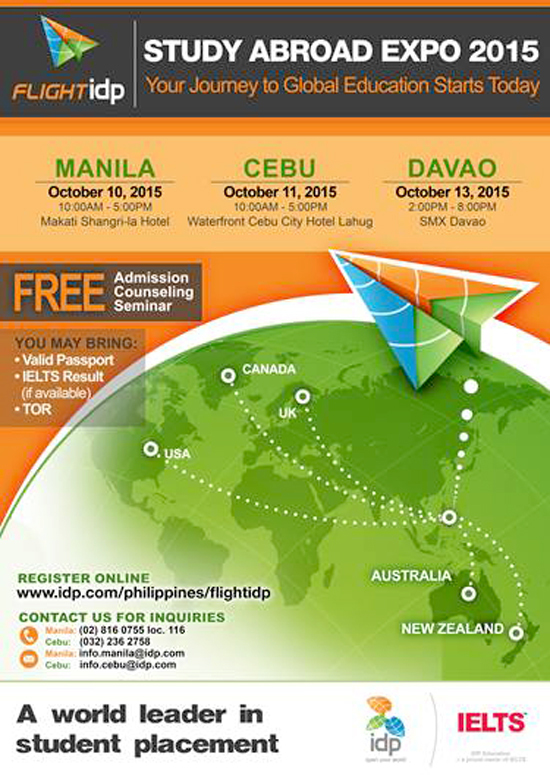 Students may bring their valid passport, IELTS results (if available), and Transcript of Records. Admission is free, so go now, register online, join the expo, and find out what the future holds for you. There’s nothing like spreading your wings and expanding your horizon to gain a wider, valuable new outlook. It allows you to have a broader and richer perspective of the world you live in, which in turn equips you with the ability to adapt to, and deal with, diverse situations—an important ingredient to success. Studying abroad presents this opportunity. Not only does it pave the way to a successful future, as far as academics and professional career is concerned, it also offers a unique opportunity to discover yourself and grow as an individual, all while gaining an understanding of a bigger world around you. Immersing yourself in a new language, a new culture, and a tradition that’s poles apart from your own, imparts valuable learnings that are beyond what any classroom can offer. A young lawyer who recently graduated from the UP College of Law, Maria Ara Garcia wanted to continue her studies and pursue a Masters in environmental law abroad. Making this decision was one thing; getting herself into a program at her chosen university is a completely different story. Garcia, who has always dreamt of living in New Zealand, is now studying at the University of Auckland, which is home to one of the best Environmental Law programs in the Asia-Pacific region. “I have just finished a semi-intensive class called Mining and Natural Resources Law. The course was taught by a very prominent lawyer and widely-published author specialising in environmental law. Last month, we went on a field trip to the gold mines and wind farms in Northern Auckland. 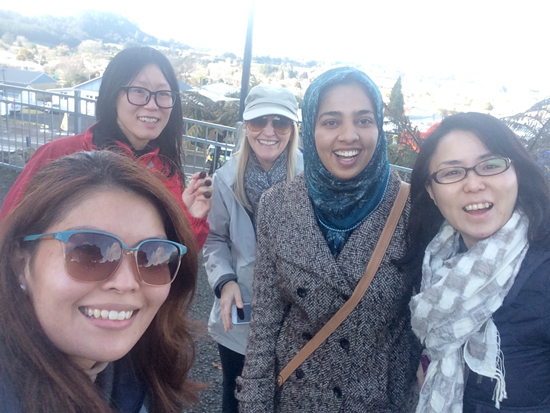 It was a very enjoyable and educational trip and I am very thankful to have been part of it,” she shares excitedly.